I don’t think there is anything better than a delicious steak grilled to perfection. The only problem is who wants to stand out in this cold over a grill to make it. Perhaps you live in an apartment where you cant grill. Well all you will need is a cast iron skillet. 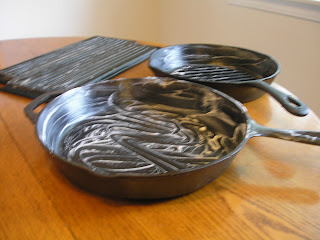 In order to ensure your steak and other foods are cooked to perfection you must season your cast iron skillet. Seasoning is making your cast iron non-stick like all the new miracle cookware. You can buy and maintain a non-stick skillet with nothing more than vegetable shortening. The best thing is that it will never wear out. 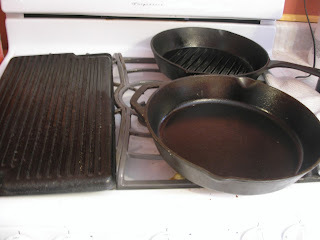 The cast iron skillet can be used to cook on the stove top, the oven or the grill. A good iron skillet can be passed down as an heirloom if taken care of properly. Make sure your new skillet has been washed in hot water and mild detergent. This will remove the factory anti-rust coating. For re-seasoning an existing skillet, just make sure to wipe the entire surface with hot water and a clean wash cloth or paper towel. Dry the skillet by heating on the cook top then let it rest and cool. Pre-heat your oven to 200 degrees. Use about a 1/4 of a cup of vegetable shortening and coat the whole skillet except the bottom. You can use your hands or a paper towel. Once you have the skillet coated, place it in the oven (at 200 degrees) and set a timer for 3 hours. This low temp will open the cast iron pores up and allow the shortening to penetrate as it liquefies. After the time is up, cut off the oven and let the skillet cool. Once it is cool enough to touch, wipe it down with another paper towel to remove most of the shortening and leave a thin coat on the surfaces. Now you are ready to use the skillet. For the first couple of uses, cook something greasy like bacon or sausage. This will help to heat cycle and re-coat the interior surface which will make the non-stick coating better. This is not a recipe really, only a suggestion. Put the marinade and the London Broil in to a zip lock bag and marinade over night. Make sure you put a pan under it, this ensures that if the zip lock bag leaks, the marinade doesn’t end up all in the bottom of your refrigerator. About a half an hour before you want to start cooking, set your beef on the counter to bring it to room temperature. Broil on medium about 15 minutes per side. You can cook it longer if you would prefer it less pink. 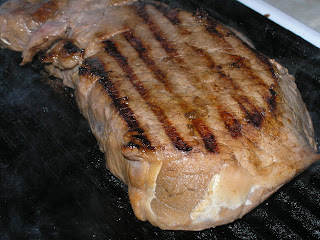 Just keep in mind, London Broil is not one of those cuts of meat that is good cooked well. It tends to resemble shoe leather when cooked to long. If you prefer your beef well, then you may want to consider a different cut.